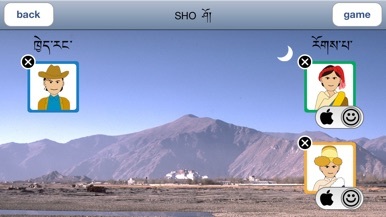 SHO is Tibetan game that uses dices. 3 players will make the game. They have 9 coins on the own home. 64 shells are lined up. Start spot is the before point of first shell, and Goal spot is the next point of last shell. 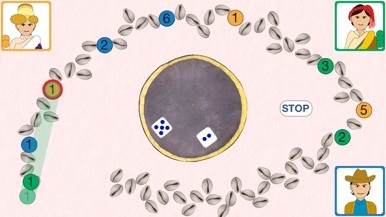 Player will roll two dices, and move the coin with the sum of the number of the two dices. When one of the player has moved all 9 coins to Goal, the player is winner. + PLACE:Coin move to new spot with the sum of the number of the two dices. + STACK:If your onother coin is exsist at the spot already, then moved coin can stack on the coin. Stacked coins can move together. + KICK:If another player's coin is exsist at the spot already, the player's coin needs to back to home. Though, if stack number of the player's coin is greater than your coin's stack number, you can not kick it. Two coins will go into Start from Home. - (1-B) When Dices are  and  , Three coins will go into Start. - (1-S) When Dices are  and  , Three coins will go into Start. - (1-K) When another player's coins exsist at the spot you will move, Coins has the number, added one than the stack numner of the player's coin, will go into Start. - (2-B) When Dices are  and  , Three coins will go into Start. - (2-N) When Dices are  and  , Nine coins will go into Start. - (2-K) When another player's coins exsist at the spot you will move, Coins has the number, added one than the stack numner of the player's coin, will go into Start. If you have coin at your honme, Onecoin will go into Start. And, if you do not move it, it will go back to Home. 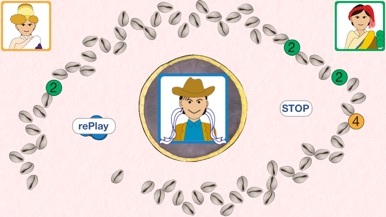 (3-B-1) You can move any coin with two. (3-B-2) You can roll the dice again, and move any coin with added number of two and agained dices. * If you kick other player's coin, you can roll the dice again. Though, if all of the coins of the player's are back to Home, you can not do it.